Liver kept alive outside human body for transplant in a world first. We can never seem to get enough organ donors—but sometimes donated organs don’t live up to their potential, either. After doctors harvest a liver from a donor, the organ is placed in a cold solution (basically, a bag of ice). If it has to travel far or the recipient isn’t ready, sometimes a liver is chilled up to 12 hours. (Steaks get better treatment.) All the while, cells are freezing, deteriorating, and dying. Every year, the United States and Europe throw away more than 2,000 freezer-burned livers—a truly tragic statistic if you’re one of the 1,500 Americans who will die in 2013 while waiting for a liver transplant. Thankfully, a team of U.K. biomedical engineers and transplant surgeons seem to have finally developed a method superior to the snow cone. 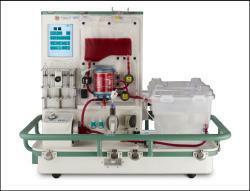 In the simplest terms, a liver is hooked up to a machine called the OrganOx® metra™ from which it receives three units of packed red blood cells. The machine heats everything up to body temperature, and the liver generally just does its thing, all without a human body. Researchers have even witnessed the overachieving organ producing bile—like a disembodied boss. It’s the first time a liver has been kept alive outside the human body. But OrganOx metra’s interface does more than that: It lets us (we’re all transplant surgeons here, right?) gather real-time information on pressures, flows, temperature, blood gases, pH levels, and bile production. That can let doctors decide with increased confidence whether a liver has suffered too much damage for transplant, either during the retrieval or during whatever circumstances led to the donation. OrganOx metra also allows for easier transport, as the whole machine can be encased in a metal to-go case with push handles, wheels, and its own backup power source. The whole kit and caboodle boosts out-of-body life up to around 24 hours and may effectively double the number of transplants we’re able to perform. The research “will make time less critical, making it possible to match an organ to the best possible recipient over longer distances, and to better prepare the recipient,” Dr. Thomas Vogel said in the press release. Vogel worked on the preclinical trials at the Oxford Transplant Center. In February, doctors even transplanted OrganOx’d livers into two patients. Any transplant requires weeks of intense observation, but both recipients are doing well. “It was astounding to see an initially cold, grey liver flushing with color once hooked up to our machine and performing as it would within the body,” said one of the machine’s creators, Professor Constantin Coussios, in the press release. “What was even more amazing was to see the same liver transplanted into a patient who is now walking around.” Coussios works for Oxford University’s Department of Engineering Science and is technical director of OrganOx. I’m calling it now: In Hangover 7, the charismatic ne’er-do-wells wake up with an OrganOx metra in their room and only 24 hours to find its owner. But Ken Jeong steals the liver to sell it for $157,000 on the black market. Hilarity does not ensue.